Housing is a fundamental human need; it is a basic requirement for a human survival. Everyone desires a home that provides a sense of ownership and identity. It gives psychological satisfaction and promotes self-esteem and confidence. A home contributes to the well-being and is essential for a person’s social and economic development. 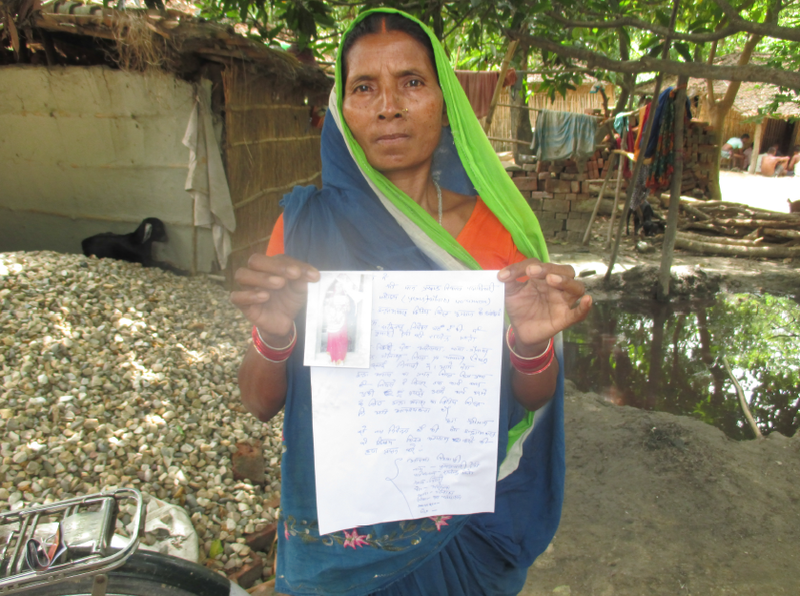 The dream of a ‘pucca house’ influenced Phoolkumari Devi and Ranjendra Mahto to enroll for Indira Awas Yojana. This yojana aims to provide assistance to build a safe and durable shelter for BPL families who are either homeless or are having inadequate housing facilities. The beneficiary of this yojana receives money in three installments. The first installment is given for the construction upto lintel level followed by second installment for the completion of the entire house. The remaining amount is given after the completion of the house. Therefore, as per the process, Rajendra Mahto initiated the construction of the house. The couple made a make-shift house within the premises next to the construction site and continued staying in that. During a door-to-door visit in Piradi village of Gaunaha block, the Soochna Seva team came across Rajendra’s house. The scene was unpleasant for the team as piles of wooden logs, a heap of sand and cement bags were lying brazenly on the ground. The constructed walls were drenched with fresh rainfall and mosses grew on them. Water accumulated inside the unfinished rooms and inside the make-shift house. The team inquired Rajendra Mahto about his dilapidated condition. He explained that he has already finished the construction of walls and was waiting for the second installment. He visited the block development office several times but each time the official demanded bribery for processing the installment. The Sochna Seva team consoled the grieving couple and took some photos of the house. Along with the required identification proofs, one of the Soochna Sevak submitted the photos and request application form at the BDO. The team assured that this application will be taken into consideration without giving bribery to any official. Rajendra thanked the Soochna Seva team and wished to receive his installment soon so that he could finish the roof and give final shape to the house.